After the promise of a straightforward 35 minute journey from London Euston, following a never-ending roam along Midsummer Boulevard, of seeing the same car parking spaces and offices again and again, the déjà vu was getting to me. Around two hours after I had began my adventure, here I was standing outside a bright pink Michael Craig-Martin box somewhat bemused, Yes this was Milton Keynes! Any apprehension as to why I had made this trek to an unfamiliar (and distinctly odd) part of the world was soon put to the back of my mind as I entered the gallery and began a new journey into Roger Hiorns world. The first thing that struck me when I entered the gallery was the colour, a sudden hit of blue. 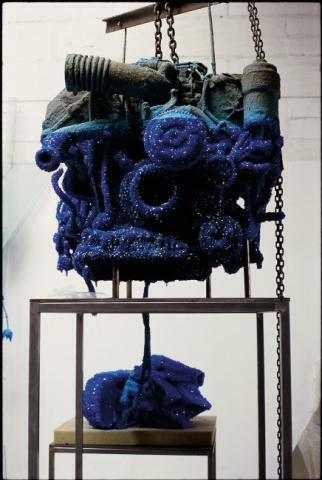 I had previously seen Hiorns’ work when it toured to Manchester during the British Art Show 6, but those small and fragile thistles dipped in copper sulphate and coyly hung from metal poles (Discipline 2002) in no way prepared me for the smack in the face that these much larger copper sulphate coated, car engines gave me, encrusted in this dense brilliant blue. Like some sort of alien faeces, a couple sat dumped on old dinning hall tables, whilst others stood high, propped on an eclectic range of stands and bases some obviously found, others I couldn’t tell where they had come from? It was like entering a morgue before the post mortems had been carried out, bodies cold and clammy waiting to be examined, or stumbling behind the scenes at a natural history museum to find evidence of a past life, like fossils, the remains of something in a Petrified state. But this was not organic matter turned to stone, quite the opposite, industrial debris had been given a new life that now appeared dormant, sleeping sculptures. Other works included in this mini-retrospective of Hiorns’ work were his series of ceramic vessels that spat out crisp columns of clean foam. Both suspended from the ceiling and propped on top of small wooden stools they were connected through a network of tubes and compressors to a system that pumped air constantly into them like an aqualung supplying oxygen on demand, making them breathe. In turn they exhaled bubbles; this was brilliant I remember thinking, very serious looking Modernist forms that were kind of undermined by this stiff, gooey, slow vomit that oozed to the ground and dribbled down the sides and all over the floor in a fine-looking, ever changing mess. Hiorns’ sculptures hovered somewhere between the man made and natural, the living and the dead, being somehow completely inert and actually moving right in front of my eyes. Unaware of my presence or in fact anything else that was going on around them, these useless yet beautiful objects it seemed, could have quite happily sat in that place forever, and I too could have sat in that place forever, Yes this was Milton Keynes!